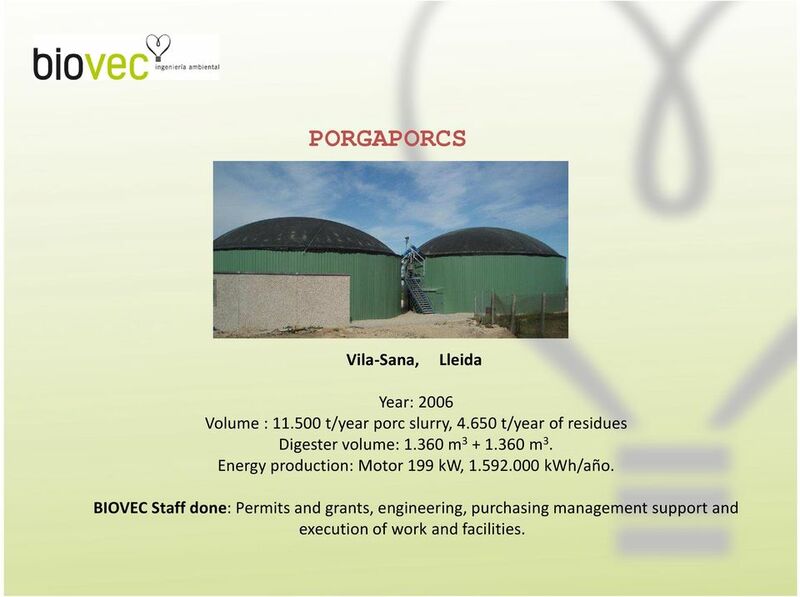 Download "BIOGAS REFERENCES AUGUST 2013. www.biovec.net"
3 PORGAPORCS Vila-Sana, Lleida Year: 2006 Volume : t/year porc slurry, t/year of residues Digester volume: m m 3. Energy production: Motor 199 kw, kwh/año. 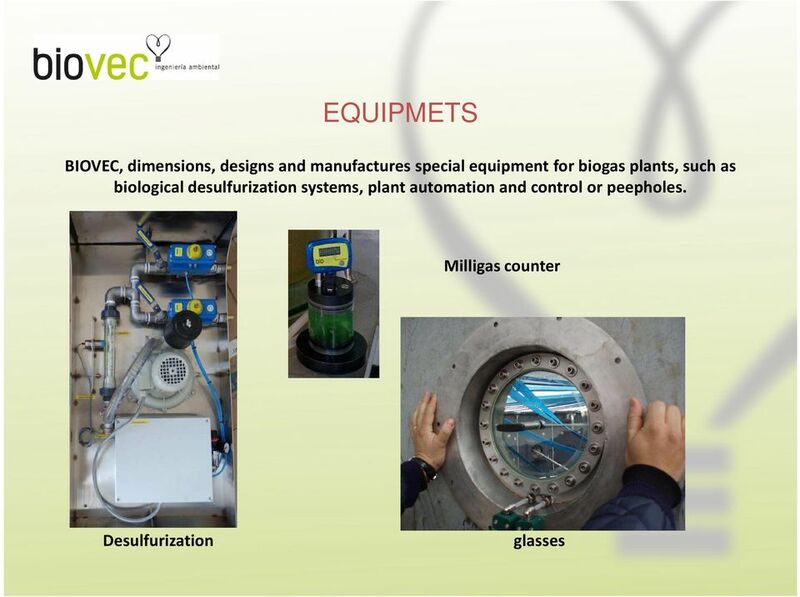 BIOVECStaff done: Permits and grants, engineering, purchasing management support and execution of work and facilities. 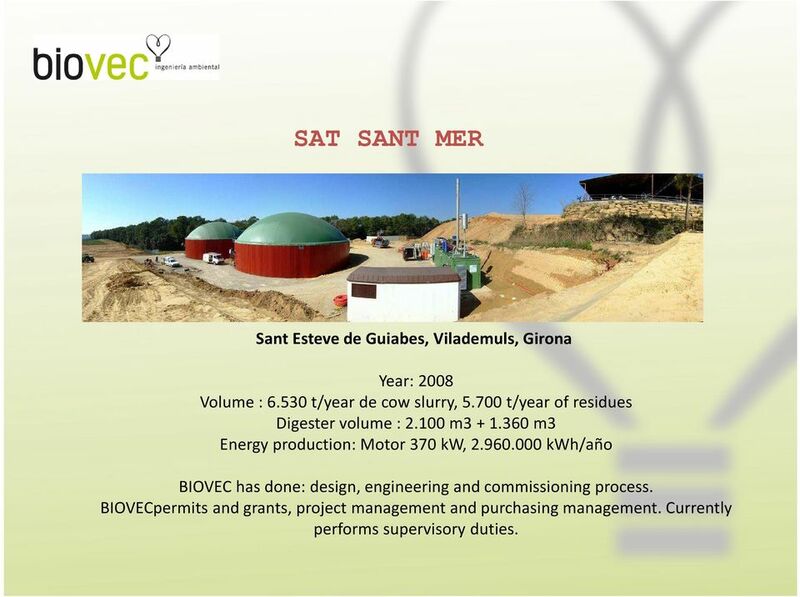 4 SAT SANT MER Sant Esteve de Guiabes, Vilademuls, Girona Year: 2008 Volume : t/year de cow slurry, t/year of residues Digester volume : m m3 Energy production: Motor 370 kw, kwh/año BIOVEC has done: design, engineering and commissioning process. BIOVECpermitsand grants, project management and purchasing management. Currently performs supervisory duties. 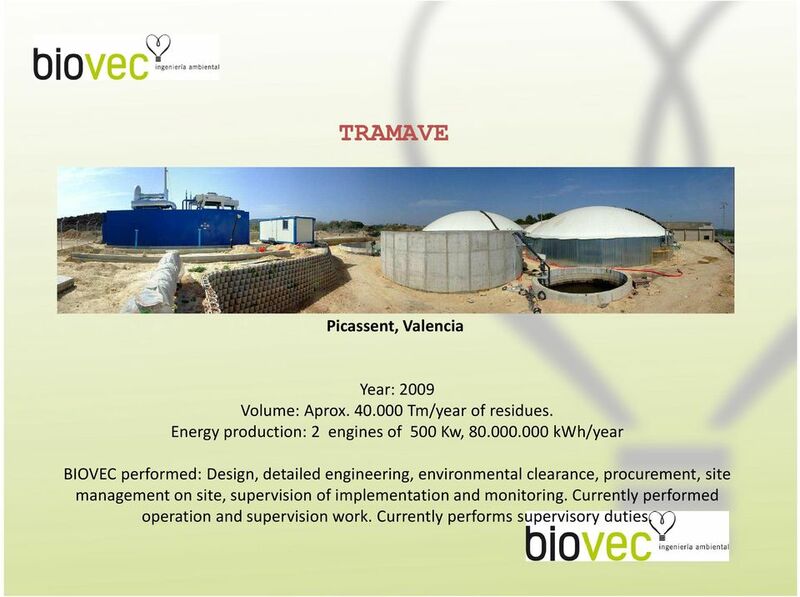 5 TRAMAVE Picassent, Valencia Year: 2009 Volume: Aprox Tm/year of residues. Energy production: 2 engines of 500 Kw, kwh/year BIOVEC performed: Design, detailed engineering, environmental clearance, procurement, site management on site, supervision of implementation and monitoring. Currently performed operation and supervision work. Currently performs supervisory duties. 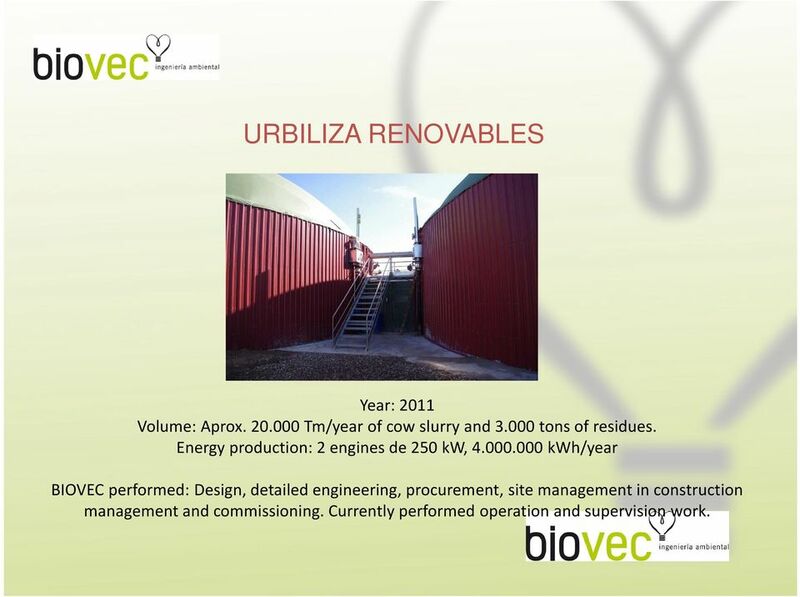 6 URBILIZA RENOVABLES Remolinos, Zaragoza Year: 2011 Volume: Aprox Tm/year of cow slurry and tons of residues. Energy production: 2 engines de 250 kw, kwh/year BIOVEC performed: Design, detailed engineering, procurement, site management in construction management and commissioning. Currently performed operation and supervision work. 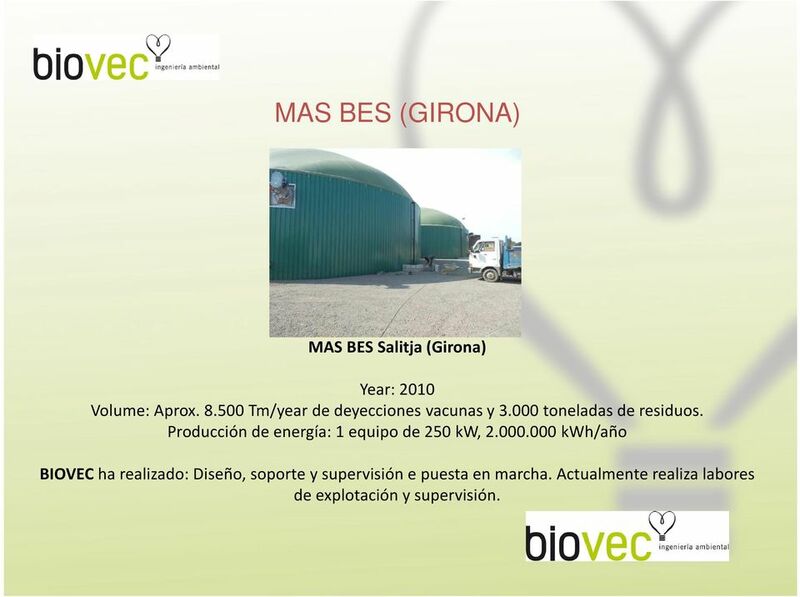 7 MAS BES (GIRONA) MAS BES Salitja(Girona) Year: 2010 Volume: Aprox Tm/year de deyecciones vacunas y toneladas de residuos. Producción de energía: 1 equipo de 250 kw, kwh/año BIOVEC ha realizado: Diseño, soporte y supervisión e puesta en marcha. Actualmente realiza labores de explotación y supervisión. 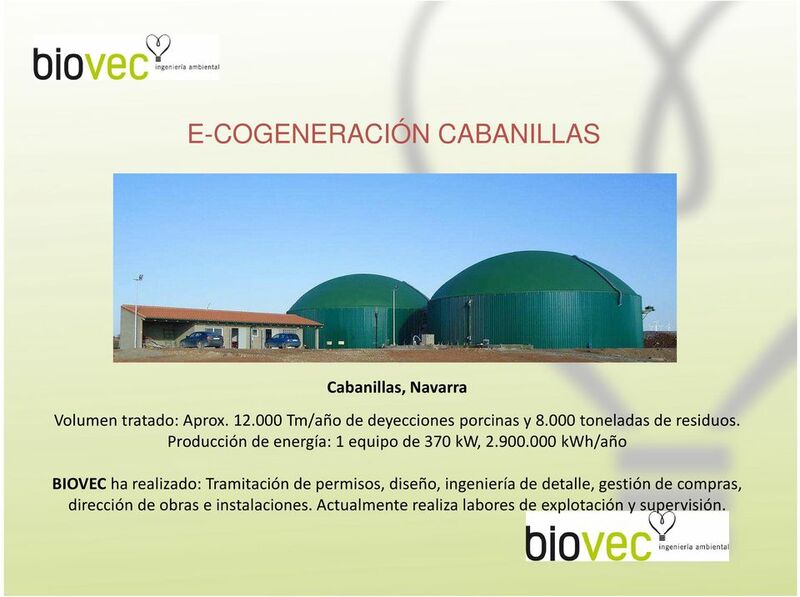 8 E-COGENERACIÓN CABANILLAS Cabanillas, Navarra Volumen tratado: Aprox Tm/año de deyecciones porcinas y toneladas de residuos. Producción de energía: 1 equipo de 370 kw, kwh/año BIOVECha realizado: Tramitaciónde permisos, diseño, ingenieríade detalle, gestiónde compras, dirección de obras e instalaciones. Actualmente realiza labores de explotación y supervisión. 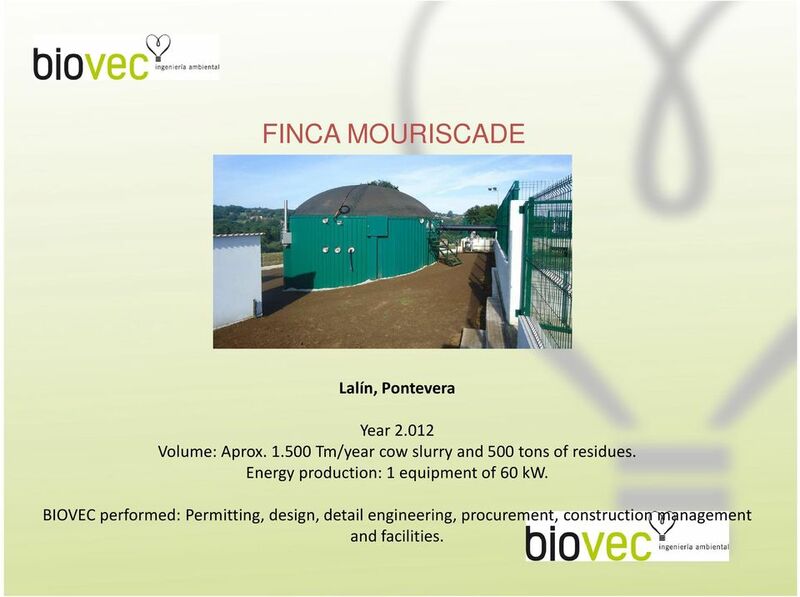 9 FINCA MOURISCADE Lalín, Pontevera Year Volume: Aprox Tm/year cow slurry and 500 tons of residues. Energy production: 1 equipment of 60 kw. 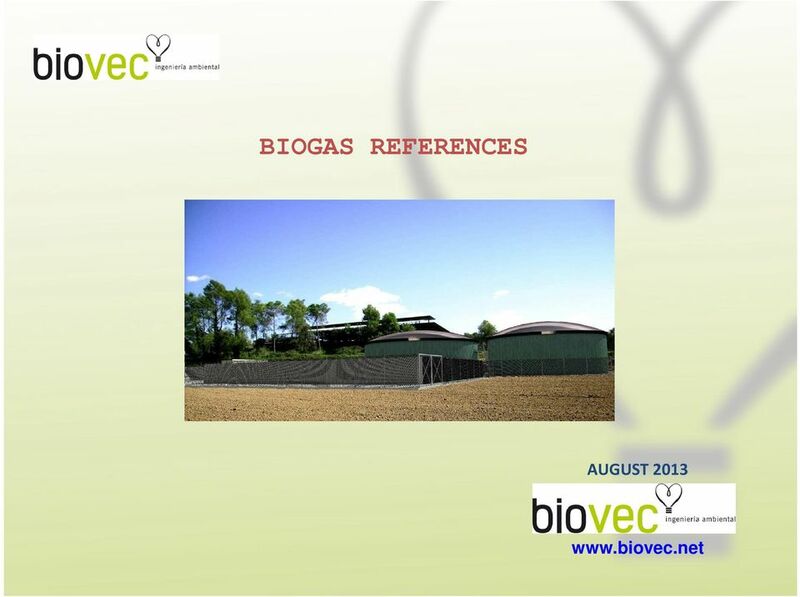 BIOVEC performed: Permitting, design, detail engineering, procurement, construction management and facilities. 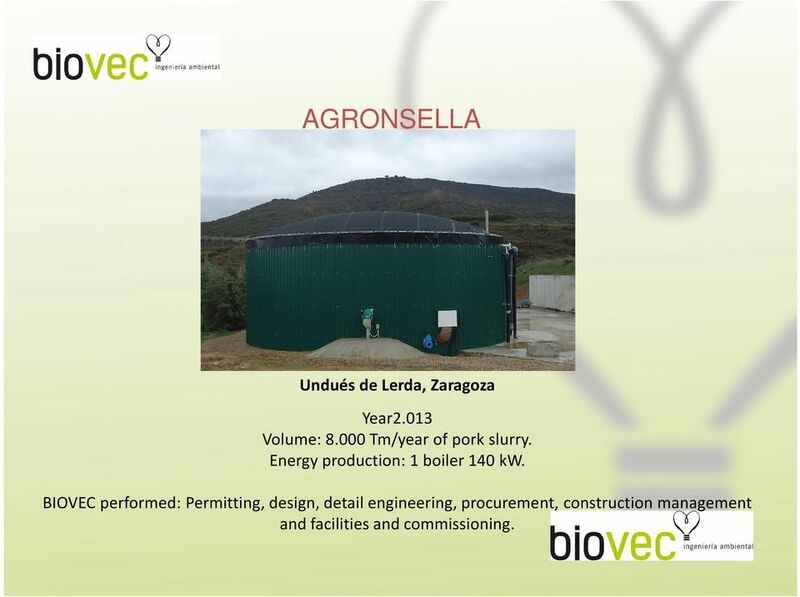 10 AGRONSELLA Undués de Lerda, Zaragoza Year2.013 Volume: Tm/year of pork slurry. Energy production: 1 boiler 140 kw. 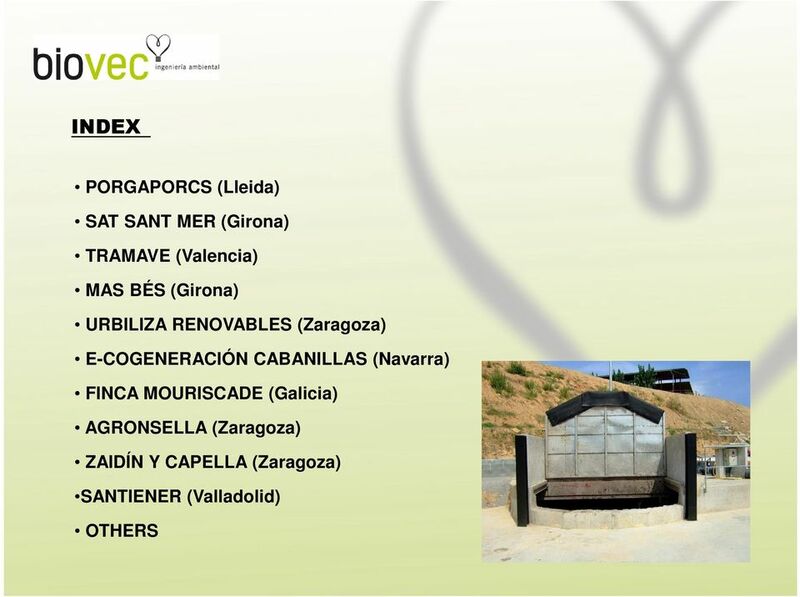 BIOVEC performed: Permitting, design, detail engineering, procurement, construction management and facilities and commissioning. 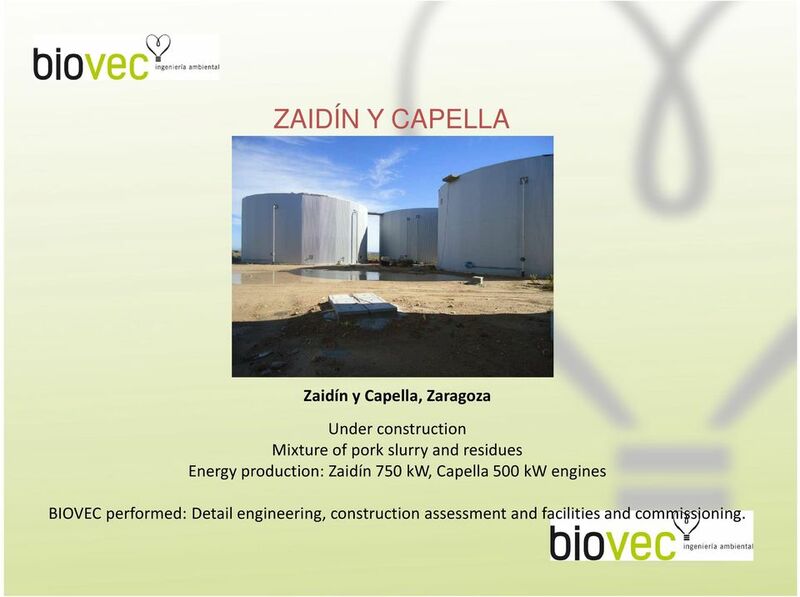 11 ZAIDÍN Y CAPELLA Zaidín y Capella, Zaragoza Under construction Mixture of pork slurry and residues Energy production: Zaidín 750 kw, Capella 500 kw engines BIOVEC performed: Detail engineering, construction assessment and facilities and commissioning. 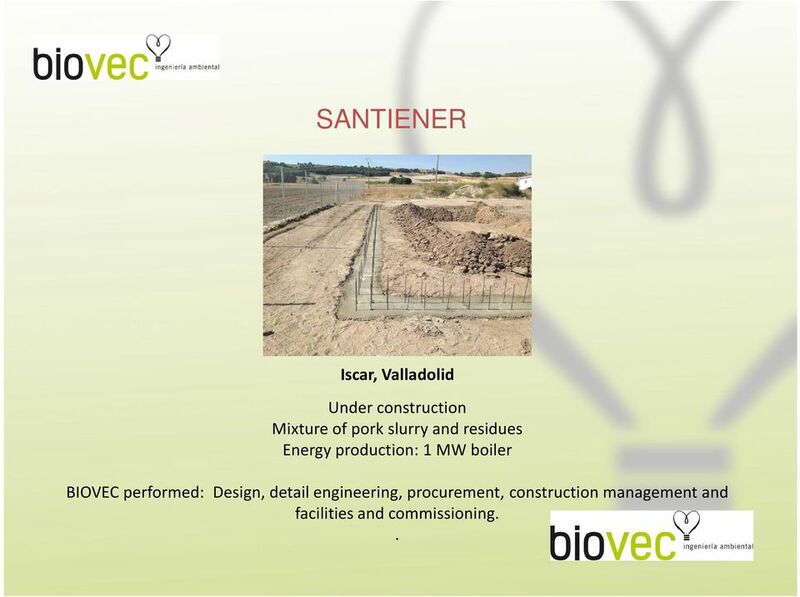 12 SANTIENER Iscar, Valladolid Under construction Mixture of pork slurry and residues Energy production: 1 MW boiler BIOVEC performed: Design, detail engineering, procurement, construction management and facilities and commissioning..
15 OTHER BIOVEC, is currently conducting a study to a region of China on the use of biogas and a new pilot biogas plant. 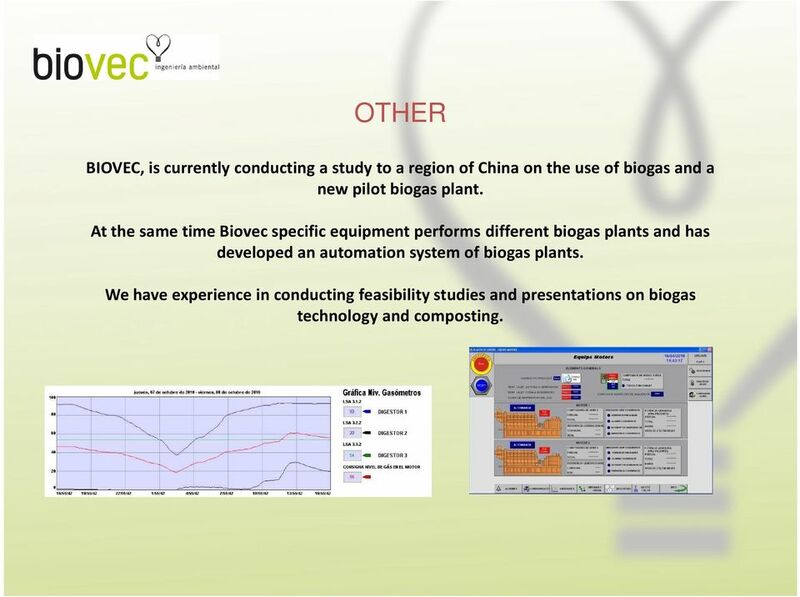 At the same time Biovec specific equipment performs different biogas plants and has developed an automation system of biogas plants. 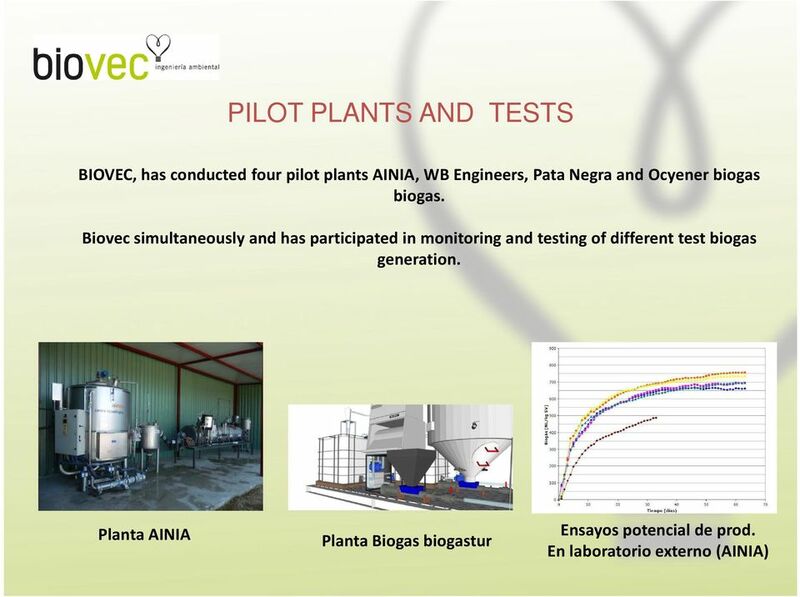 We have experience in conducting feasibility studies and presentations on biogas We have experience in conducting feasibility studies and presentations on biogas technology and composting. Titulaciones universitarias coherentes con la producción agraria de cada región J. Del Cerro 1, A. Perdigones 1, S. Benedicto 2 y J.L. García 2 1 Escuela Universitaria de Ingeniería Técnica Agrícola. Madrid. RENOVA HCM SOLUCIONES INTEGRADAS QUE TRABAJAN PARA SU NEGOCIO. www.renovasolutions.net. Copyright 2015 RENOVA Solutions, Corp. All rights reserved. w w w. a h a s o c i a d o s. c o m industrial industrial asociados Since its beginnings ah asociados has been related to the industry developing several works of a great complexity and different scale. ESTUDIO DE LA VIABILIDAD TÉCNICO-ECONÓMICA DE UN SISTEMA DE ALQUILER DE VEHÍCULOS ELÉCTRICOS. Gestión del Mantenimiento de una Planta de Tratamiento de Aguas. Autor: Albarrán Cuevas, Sergio. Directora: Fernández Membrillera, Vanesa. Patters of evolution of the Mexican clearing house system (1940-1980) Demography or Levels of Economic Activity? Gustavo A.
I FORO SOLAR ESPAÑOL Los desafíos de la energía fotovoltaica en la era post primas El sistema marginalista de fijación de precios es compatible con las energías renovables? 2014-11-19 José Javier González.